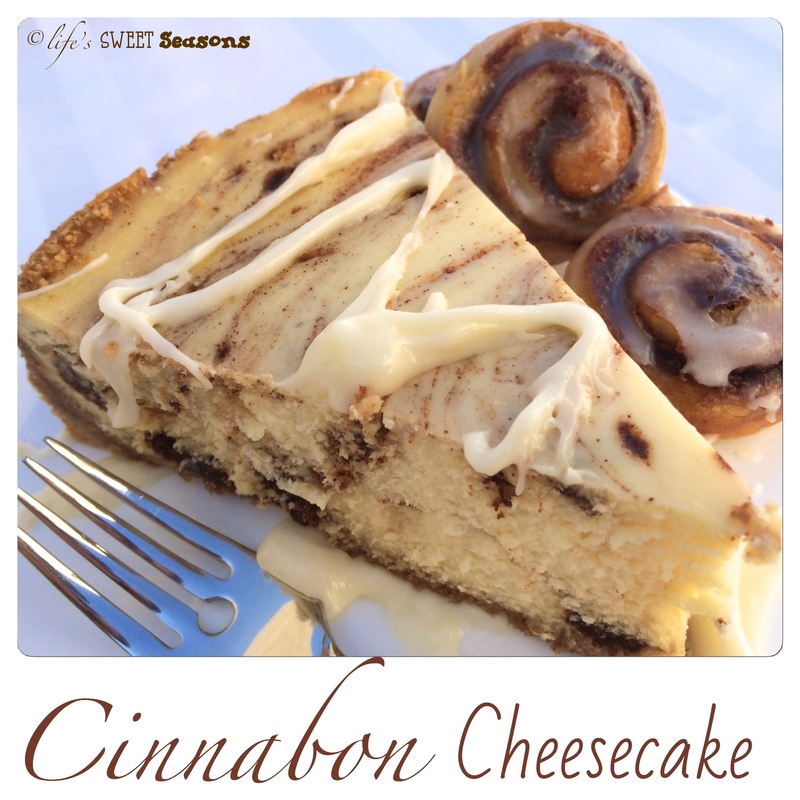 TGI Fridays sometimes carries a Cinnabon Cheesecake on their menu, but like all of our favorite restaurant items, sadly it is seasonal. Mike and I first tried it in California (a time before kids when we actually went out to eat) and we LOVED it! Since it was never around when we needed it, I started trying various online versions, none of which lived up to our expectations. After continuously being utterly disappointed, I was forced to come up with my own. 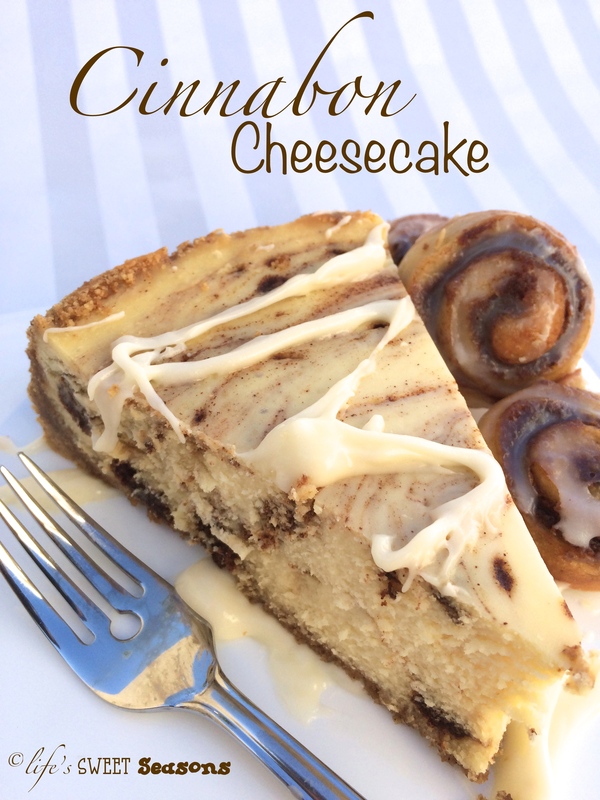 Let me just say that Mike’s eyes get big and round and he does a happy dance when I say I’m making one of these cheesecakes, and whenever it’s his turn to pick which type of cheesecake he wants, this is always the winner. What’s funny is that this isn’t only Michael’s favorite cheesecake. This December when I went home Nando (my brother-in-law) asked me to please make him one, which is when I took these pictures. It made me laugh because it reminded me of the time Mike and I took Lori and Nando to try their first Cinnabon Cheesecake. They had come to stay with us in California before we were going to head to Kauai for a couple’s retreat. Mike and I didn’t have kids yet and Lori and Nando had left theirs with grandparents, so we all enjoyed a night out before catching a flight the next morning. What’s funny is that we didn’t go to TGI Fridays for dinner. We went somewhere completely different. 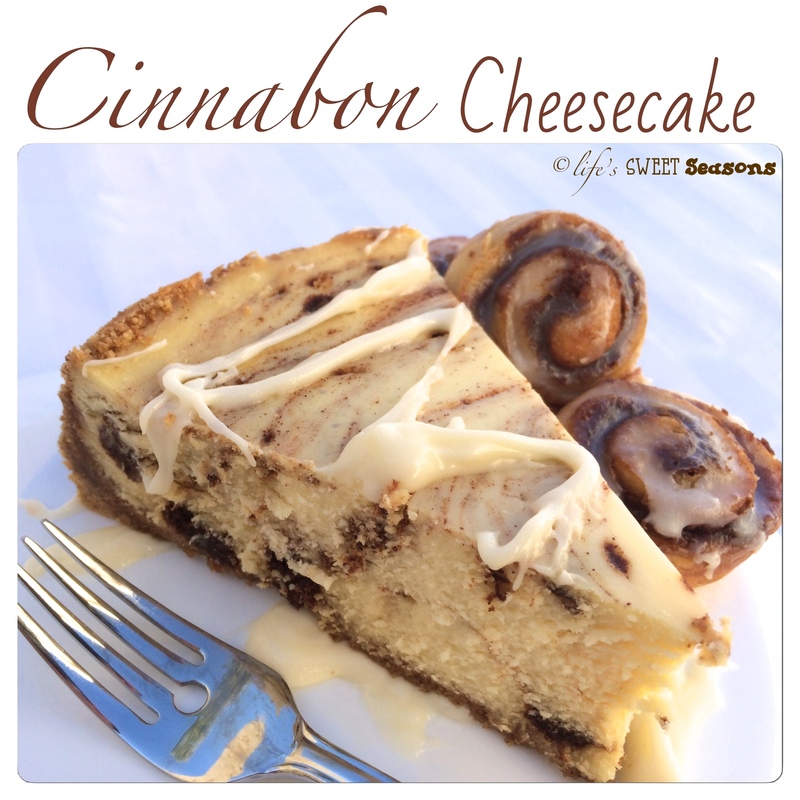 Then when we decided maybe we did have enough room for dessert we ordered some Cinnabon Cheesecake to go and ate it in the car on the ride home. We were trying to be frugal so we ordered two slices to share among the four of us. What’s funny is how each couple dealt with the fact that we had to share. Mike was driving so I would dutifully take one bite and then feed him his bites after each of mine. We ate slow and sighed gluttonously after each bite. Lori and Nando each took their first bite and then a war broke out in our backseat. It sounded something like this: “Oh my gosh that is soooo good,” Nando groaned. “Mmmmmm…delicious!” Lori exclaimed. “Hey gimme more of that!” Nando said reaching for the cheesecake. “It’s not your turn yet, your bite was bigger than mine. I need to catch up!” Lori argued. “Oh wait! Holy cow! Now we’re even. That was twice as big as my first one. Now I’m keeping it!” Every once in a while I would glance in the back and see forks flying towards the cherished cheesecake. They were both out of their seat belts trying to ensure he or she would get the next bite. Mike and I were dying laughing in the front seat and still had probably half of our piece of cheesecake left when Lori and Nando had finished theirs. “Nando, look. They’re still eating and ours is gone. Lisa’s not even cheating. She’s feeding Mike nicely. What does that say about us?” Lori asked through giggles. Butter a 9-inch round springform pan. Combine the above ingredients in a food processor and blend until it resembles course crumbs. Press into the springform pan. Beat cream cheese and sugar until smooth. Combine the rest of the ingredients and beat well. Pour half of the filling batter into the springform pan. Put half of the cinnamon filling on top of the batter by dolloping spoonfuls. Use a butter knife to swirl cinnamon into the batter. Only swirl 4-5 times, you want the cinnamon in chunks so you don’t want to break it up too much. Top with the rest of the batter and repeat with the rest of the cinnamon. Swirl again. Turn the oven down to 250 and bake for an additional 60-90 minutes. The center should still be slightly wet and wiggly. Take the cheesecake out and use a knife to loosen the sides of the cheesecake by running your knife between the crust and the pan. This will help prevent it from cracking while it cools. Allow the cheesecake to cool in the oven until room temperature. I tend to leave my oven door open slightly and leave it in there overnight. Cover with plastic wrap & place the cheesecake in the fridge for 6-8 hours. Slice and drizzle with cream cheese frosting. Beat or whisk the cream cheese and butter together in a large bowl until combined. Do NOT replace the butter with margarine as the consistency will not be the same. Add vanilla and milk and continue to beat/whisk. Gradually add the powdered sugar a cup at a time and blend until smooth. If you find the frosting is too thick for your liking you can add a small amount of milk. Notes: This makes enough frosting to cover an entire carrot cake, or about 24 cinnamon rolls, so you’ll definitely have leftovers. Refrigerate the leftovers in an airtight container and plan to have cinnamon rolls the next morning!